Since the mid- to late 2000s, there has been a dramatic rise in the use and abuse of synthetic derivatives of cathinone, a stimulant alkaloid found in the African shrub Catha edulis. Cathinone novel psychoactive substances (NPS), also referred to as synthetic cathinones or “bath salt”-type drugs, have gained popularity among drug users due to their potency, low cost, ease of procurement, and diverse array of evolving chemical structures. While the ability of cathinone NPS to produce psychotomimetic effects, multiple organ system toxicity, and death in humans is well documented, there has been limited scientific investigation into the reinforcing effects and abuse liability of these drugs. In this chapter, we will summarize the existing literature on the reinforcing effects of cathinone NPS in rodents using the intravenous self-administration (IVSA) paradigm. 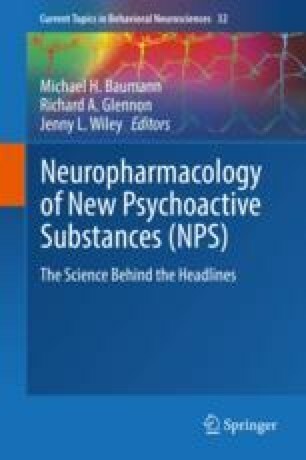 We will also compare the ability of cathinone NPS to serve as reinforcers to that of classical psychostimulants such as cocaine, methamphetamine, and methylenedioxymethamphetamine (MDMA). The chapter will conclude with a summary and indications for future avenues of research on cathinone NPS. The authors wish to acknowledge Public Health Service grant R01DA025606 from the National Institute on Drug Abuse for supporting our initial studies on cathinone NPS abuse potential.